Three key trends are driving the significance of Application Modernization – consumerization of IT and increasing customer expectations, availability of technology at an affordable cost, cloud-native and reliable technology. Each of these presents its own challenges, but with a strategic approach, the revolutionary benefits of Legacy Application Modernization can be achieved. With Microsoft Azure gaining ground in the Cloud infrastructure race, this blog aims to discuss the cutting-edge features and advantages of Legacy App Modernization using Microsoft Azure and the Key things to consider when your application takes on the Azure outfit. 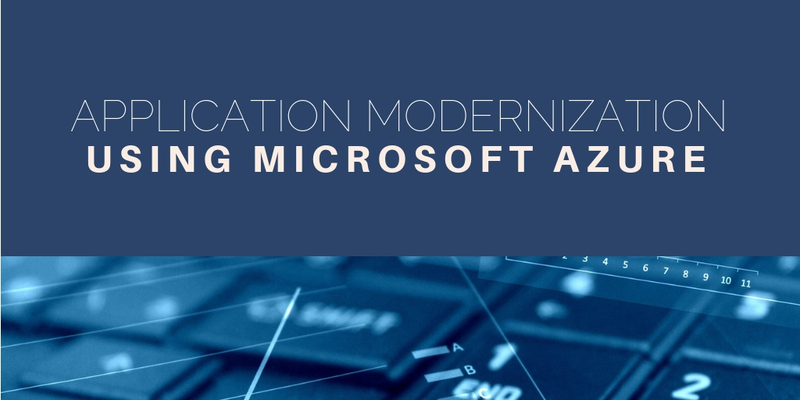 Read on to explore the top 4 ways how Application Modernization using Microsoft Azure helps you gain the competitive edge. Go from Idea to Production Faster – Customers expect more personalized and connected experiences. Moving Legacy Applications to Microsoft Azure enables you to deliver value faster and respond to changes driven by customer demands. By using flexible resources like PaaS and serverless architecture, Microsoft Azure helps you deliver nimble solutions, thereby increasing customer value and focusing on the functionality that will provide value today. Customer Feedback – As part of your App Modernization strategy, you can implement functionalities that help you figure out how your customer uses your application, which enables you to deliver better experiences faster. Give your customer input into your backlog by applying instrumentation and logging an App Modernization strategy that helps you understand how your applications are used, and helps you to quickly react to changes in behavior. Encourage Experimentation – Microsoft Azure enables new ideas, products, and services. It allows your teams to use hypothesis-driven development techniques to experiment different business models and workflows, iterate quickly, and deliver innovation through Legacy Application Modernization tools. Better decision making – Through Legacy Application Modernization using Microsoft Azure, teams can create new efficiencies and get quick and easy access to data that will empower them to make decisions about the business and your customers. Microsoft Azure enables your team to stay on top of the latest technologies, and have the satisfaction of seeing how their work impacts customers. Deliver fast and deliver value – App Modernization with Microsoft Azure helps you leverage microservices, serverless architecture, and containers to remove huge dependencies within your products and create smaller and independently deployable components. These leaner and quickly – evolving applications will lead the way to a new business model that evolves expeditiously and helps you gain a competitive edge. Application Modernization using Microsoft Azure also allows you to get to market quicker and with greater agility with 13x more software releases and innovate faster to solve customer problems sooner. Customized experience – Legacy Application Modernization using Microsoft Azure enables your customers to get a more personalized experience from your products, take absolute control of the usage of the product, and get quick access to options not easily implemented with older, monolithic applications. Operational Insights – Microsoft Azure-based App Modernization approach helps you understand how your application runs and how it is used, and quickly respond to changes in behavior. Microsoft Azure’s integrated analytics helps your team find problems before your customers do. Elastic Resources – This next-gen Application Modernization approach enables you to expand or decrease resource usage to meet changing demands without worrying about capacity planning and engineering for peak usage. Use monitoring tools built into Microsoft Azure to allocate additional resources without disrupting operations and reduce scale times to minutes and seconds. Cost Savings – Pay only for what you use and reduce your hardware costs. PreludeSys is a Microsoft Gold Partner and has been trusted by our clients for Application Modernization and development using Microsoft, since 1998. With two decades of experience in modernizing legacy applications for our clients across various portfolios, PreludeSys brings with it broad expertise to help you achieve success in your Digital Transformation journey. Contact us now, and our team will visit your premises and prepare a Digital Transformation Assessment Report, absolutely FREE. Previous Previous post: 3 Mobile-First Digital Transformation Strategies you simply can’t ignore!